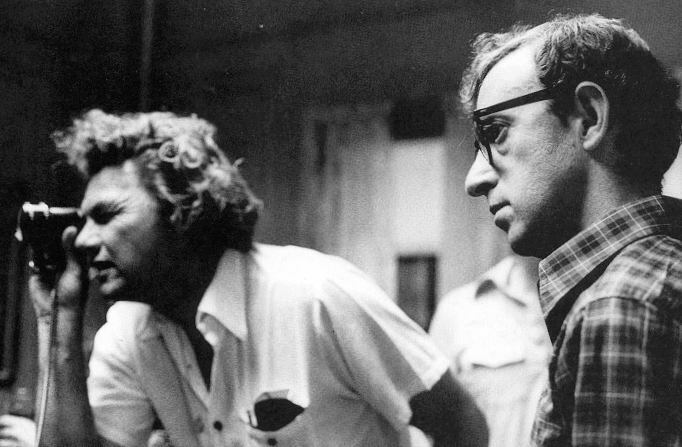 Willis, left, on the set of Annie Hall with Woody Allen. All of these locations and all of these songs would not have the effect they do without the widescreen black and white cinematography of Gordon Willis. This is one of the best-photographed movies ever made … Some of the scenes are famous just because of Willis’ lighting. For example, the way Isaac and Mary walk through the observatory as if they’re strolling among the stars or on the surface of the moon. Later, as their conversation gets a little lost, Willis daringly lets them disappear into darkness, and then finds them again with just a sliver of side-lighting. Here are Manhattan’s iconic bridge scene and an hour-long interview with Willis.